A man police say could be "armed and dangerous" is on the loose after ramming a tow truck into a Red Oak police cruiser early Sunday morning. 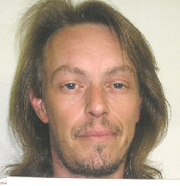 Thirty-eight-year-old Michael Dean Mundorf of Griswold is described as a six-foot, five inch white man who has brown hair and blue eyes and weighs about 180 pounds. Mundorf faces charges of felony eluding and assault on a peace officer and numerous traffic related charges. He is also wanted for an aggravated misdemeanor warrants from the Iowa State Patrol for Contempt of Court and Driving While Suspended. Mundorf has a long rap sheet, including a 2005 arrest for drug possession, and other arrests on theft and criminal mischief charges. Police say just after two a.m. Sunday, Red Oak Police began pursuing Mundorf, who was driving a 1972 Chevy Tow Truck. A policeman tried to get him to pull over, but Mundorf accelerated and a chase started. At one point, police passed his truck and tried to box him in, but Mundorf rammed the police cruiser and the chase continued into Pottawattamie County, but the tow truck and the deputy’s car got stuck. Mundorf and a passenger fled into a corn field. That passenger, 62-year-old Frank Ernest Kutz of Lewis, Iowa, was caught. Authorities are asking the public’s help in tracking Mundorf down.